Geographic Imager® mapping software enhances Adobe Photoshop to make working with spatial imagery quick and efficient. 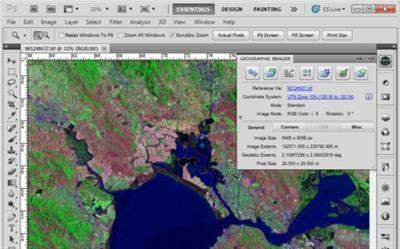 It adds tools to import, edit, manipulate and export geospatial images such as aerial and satellite imagery. Enjoy the use of native Adobe Photoshop functions such as transparencies, filters, pixel editing, and image adjustments like brightness, contrast, and curve controls while maintaining spatial referencing. 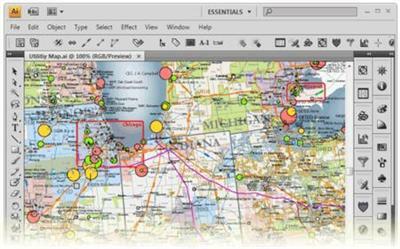 MAPublisher® cartography software seamlessly integrates more than fifty GIS mapping tools into Adobe Illustrator to help you create beautiful maps.Import industry-standard GIS data formats and make crisp, clean maps with all attributes and georeferencing intact using the Adobe Illustrator design environment. Finally, high-quality map production software that works. MAPublisher cartography software seamlessly integrates over 40 GIS tools into the Adobe Illustrator environment to help you create maps the way you want, how you want. Import the most widely used GIS data formats, including those from ESRI, MapInfo, MicroStation, AutoCAD, Google and the U.S. Government. Finally, high-quality map production software that works. MAPublisher cartography software seamlessly integrates over 40 GIS tools into the Adobe Illustrator environment to help you create maps the way you want, how you want. Import the most widely used GIS data formats, including those from ESRI, MapInfo, MicroStation, AutoCAD, Google and the U.S. Government. All GIS data attributes and geographic parameters are maintained, are fully accessible and editable.